Over the last decade, the Internet has become one of the most important means of communication in all social areas. The success of Web technology adoption in the private sector has put pressures on the public sector to adopt the Internet to present information and service resources. The concept of creating more efficient and convenient interaction between government and the interacting parties using Internet technology is referred to as electronic government (or digital government). 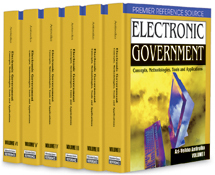 Recent studies have shown an increase in the adoption of electronic government by various countries (Archer, 2005; I-Ways, 2005; Janssen et al. 2004). Nevertheless, the level of implementation diverges from country to country. This study identifies critical success factors of electronic government and proposes an implementation framework. This chapter presents an extensive case study to illustrate how the proposed framework can be used to analyze electronic government strategies in a developed country (United States) and a developing country (China). In conclusion, recommendations are made to developed and developing countries for their implementation of electronic government.